Conversations with Meredith Monk offers a richly detailed portrait of the internationally renowned composer, performer, director, and filmmaker who has helped to create the new vocabularies of contemporary performance. Reflecting on her creative life in music, performance, and film over her entire career, Monk offers fascinating insights into how she works, the questions she asks herself as an artist, and the deeply held personal views of art practice as spiritual practice. Meredith Monk celebrated her 50th year as an artist in 2014-2015, which included an appointment for the Richard and Barbara Debs Composer’s Chair at Carnegie Hall. In the late seventies, she formed Meredith Monk & Vocal Ensemble. Among her many operas and music-theatre works are On Behalf of Nature, mercy and Songs of Ascension (both with the artist Ann Hamilton), Quarry, Education of the Girlchild, and Vessel. 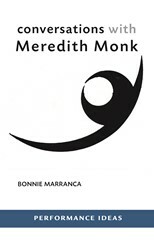 Bonnie Marranca is the author of three volumes of criticism, Performance Histories, Ecologies of Theatre, and Theatrewritings. She has also edited several play anthologies and essay collections.